Changes were implemented swiftly and bluntly at Tynecastle, but the strategy had been meticulously pieced together. Football clubs tend to lurch from one regime to another, leaving scant room for coherent planning, but the financial crisis at Hearts was an opportunity to mull over the fundamental problems. Having revealed her solutions, Ann Budge is now perceived to be a ruthless operator. She will welcome that depiction, since football club owners who appear to be a soft touch are quickly preyed upon. Budge has been waiting for several months to take charge of Hearts, so nobody should be surprised that little time was wasted once she gained control. Sympathy for Gary Locke is a natural reaction to his departure, not least because the team had been revived in recent weeks. He is also entitled to rankle at the choice of his successor, since it is the untried Robbie Neilson who now has responsibility for training the squad and selecting the starting line-ups. Locke managed through a period of turmoil, when problem-solving was paramount, whereas Neilson has scant experience. Locke also presided over spells of abject form, too, although there is no available evidence for Neilson's qualities as a head coach since he is a rookie. 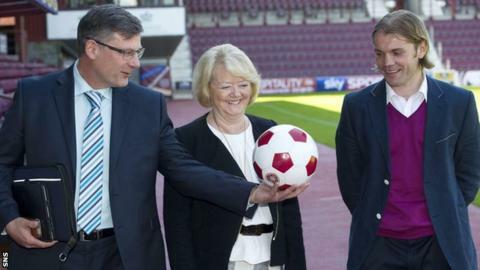 Nonetheless, the key attribute was the ability to work with Craig Levein, who Budge installed as director of football. The club is open to reform, because every aspect of the organisation has been diminished by Hearts' spell in administration. Unusually for football, no decision has been made on the basis of a hunch, and Budge has been in discussions with Levein for several months. The result is a clear-eyed objectivity. Hearts cannot afford to dwell in the Championship, but the primacy of short-term thinking has been eschewed. It has become a buzz phrase for new managers to talk about five-year plans when they are appointed, but too often that is a glib attempt to stave off the inevitable periods of criticism. The overhaul at Hearts, though, is based upon constructing sound foundations to enable the club to develop and progress through a sustainable approach. Levein will also be rebuilding his reputation. His time in charge of Scotland ought to have felt like the pinnacle of his career, but results were disappointing and towards the end he was a manager pursued by recriminations. The mistakes of that time cannot be overlooked, but neither should Levein be condemned to obscurity as a consequence. Budge, for instance, will have been more concerned with the work he carried out at Tannadice. Levein was a conventional manager at the outset, but the trust and faith of the Dundee United owner Eddie Thompson enabled a wider ambition. Levein will not be on the front line at Tynecastle, since responsibility for the team's performances will surely be carried by Neilson, but his role is more critical. After two years at the club, Levein combined the roles of manager and director of football. His remit was to restructure the youth policy, and specifically introduce a new philosophy to the way that young players were trained. It was not simply a bout of egotism, though, since Levein had fresh ideas about how young players, particularly those under 13, are trained in the technical aspects of the game. He appointed Ian Cathro, a 23-year-old with no playing experience, in a role educating the youth coaches, with the focus being on developing touch and ball skills while children were at the right age to influence behaviour and instincts. It is noticeable that coach education was included amongst a general discussion about his intentions for Hearts. The progress of players is affected by a number of factors, among them luck and attitude, but United's youth academy was set up so that talent is nurtured in a specific way. The emergence of players such as Ryan Gauld is testament to that structure. Levein will not be on the front line at Tynecastle, since responsibility for the team's performances will surely be carried by Neilson, but his role is more critical. It is the senior man who will be the architect of Hearts' sporting infrastructure, and it is his responsibility to appoint the coaches and staff who directly influence results. He often displays the intensity of a zealot, and he has been known to react in a prickly fashion to perceived slights, but the manner is in keeping with the passionate self-belief of an idealist. He now has the opportunity to remodel the football operation at Hearts, which deserves to be considered a more meaningful role, at least in the long-term, than that of the head coach. It is inevitable that Levein will have a bearing on the first-team since he will be in constant discussion with Neilson. While the latter insisted that he will be making the selection decisions, it is inconceivable to think that the director of football will not influence those choices, even if it is just through dialogue alone. Levein has always been a strategist, but previously it was confined to the narrow field of the management of football teams. His sides and their preparations were always well-organised and tended to be comprehensively effective, at least on the domestic stage. He now has scope to make grander plans, and the likelihood is that Hearts will be immediately competitive in the Championship and stronger for the difficult decisions made in the first few days of Budge's reign. Budge has implemented a contemporary management structure. The old guard of the game may still sneer at some of the logic, but clubs are either investing too much money, or are so reliant on the effectiveness of their academies, that recruitment and coaching decisions can no longer be radically altered with every change in manager. Clubs need an overarching strategy if they are to limit the chances of them periodically veering into moments of crisis. Locke is a much-admired figure, and Levein is not short of critics, so some of the reaction to events was always likely to be scathing. It is, though, a decision based on solid principles. The mission statement from Budge and Levein was precisely appropriate to Hearts' needs.